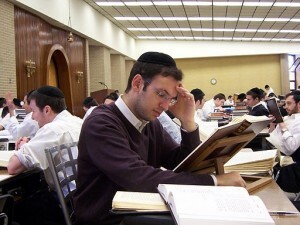 A yeshiva student. Photo: Wikimedia Commons. Every Friday night, I help run a “Carlebach” service in Beit Shemesh. It’s a unique service that brings together Jews from all backgrounds to pray, sing and dance on a weekly basis. While closing up the synagogue this past Friday night, a Hasidic man in his early thirties who was at this service for the first time approached me and introduced himself. I began telling him how bad I felt for him, but he cut me off. He said that despite the protests against the stipend cuts from many in the ultra-Orthodox community, he and many others supported our effort. He also agreed that working to support your family with dignity is not only consistent with being a Talmudic scholar and fervently religious, but is actually the ideal. I told him that he was correct, and that was why my political party, Yesh Atid, cut into the funding of schools that did not teach English, and pushed to introduce English instruction in all schools. I said that I needed to start walking home, and he asked if he could join me to ask one last question. I told him that many are active soldiers, and that two or three of them were home from their first week of basic training. I told him that many in Israel are aware of the problem, and reassured him that we are committed to correcting it — and that this was among the reasons I entered politics in the first place. This remarkable conversation reminded me to tune out the propaganda and rhetoric coming from the ultra-Orthodox media and its political leadership, and to keep on working at the important task at hand. The American ultra-Orthodox and yeshiva community must wake up and recognize that this Hasid was not an aberration. He is a part of the silent majority whose voices have been stifled but are crying for help. We must not fight them; but help them. This is what will ensure the continuity of Judaism for generations to come. Rabbi Dov Lipman served in the Israeli Knesset (2013-2015) with the Yesh Atid party, the first American born MK in 30 years. He holds rabbinic ordination from Ner Israel Rabbinical College and a Masters Degree in Education from Johns Hopkins University and currently serves as Director of Public Diplomacy in the vice chairman’s office of the World Zionist Organization.